Through all of human history, people have wanted to communicate with each other. When messages had to travel greater distances, smoke signals and drumbeats came into use. About the 5th century, someone thought of using carrier pigeons to deliver written notes. Clever as this was, it wasn’t entirely reliable: one strong wind, a rainstorm, or a hungry hawk could intercept an urgent message. With the advent of the telegraph in 1838 and the telephone in 1876, telco was solidly on its way. Although a storm could still take down wires, there was a more reliable network carrying voice and text data nearly anywhere in the world. The first videophone was tested in 1920 but didn’t take off. Perhaps people preferred talking to one another without worrying about formal attire. Pagers, one of the first wireless devices, introduced as a special service for doctors in NYC around 1950, were commercially available by the 60s and ubiquitous by the 80s. Fax machines have moved from wired to wireless, and are still standard in some places. Although car phones originated in 1946, and the concept of wireless telephony was popular for years earlier, the first real handheld mobile phone only emerged in 1973. The cellular systems then were very primitive. The first mobile cellular network was created in 1981, soon followed by the arrival of email. Telecom, computer communications, and networking technologies have intersected at various points, moving towards a more convergent stream of development. Computer telecom began with teletype, evolving from simple terminals wired to a mainframe, to packet-switching data relays. The internet first started running on existing telephone networks. We’re mirroring that cross-pollination now, with OTT television, voice, and video on mobile, IoT-controlled smart mobile, and digitally-based voice offerings such as VoLTE coming from traditional CSPs. With virtualization crossing into telecom from IT sources, the merging of the two timelines continues. Telco networking has always involved the upkeep and installation of high-maintenance metalware and miles of wire. What we retroactively call 1G, and telco’s next big jump to 2G, digital cellular, were a vast but necessary time and money hemorrhage, continuing with the switch to 3G and then 4G LTE. It’s a resource bleed, installing shiny new proprietary gear while ruefully removing the last round of expensive, obsolete hardware, and getting the newly-connected networks to behave properly, with as few dropped calls and data packets as possible. Changing over to developing tech always comes at a cost, but the ongoing massive expansion of mobile users and mobile carriers, plus the upcoming segue to 5G, simply cannot be built on an equivalent spending model. There has to be a better way. There is. Carrier service providers are shifting increasing percentages of their data and operations to cloud computing. Cloud-controlled virtualization is an unfolding process we’re all revealing more of as we experience it. As virtualization matures and accelerates, there’s always more to learn. In 2014, Gwyneth Paltrow and Chris Martin referred to dissolving their relationship as a 'conscious uncoupling'. A year or two earlier, decoupling began for new forms of networking structures. By now, the hardwired status quo is out the window, but it’s a very positive breakup. SDN and NFV are working together to make it easier for us to think of the proprietary hardware we’ve been depending on as just somebody that we used to know. SDN (software-defined networking) separates the network’s control plane and data/forwarding plane in order to offer a high-level overview of the distributed network. This exponentially increases efficiency for management and automation of network services. SDN works as a base for NFV, almost like an operating system. Here’s a simplified look at SDN in action (below). You can see the programmable control plane in the center, the data and forwarding plane at the bottom and the network functions at the top. Fig. 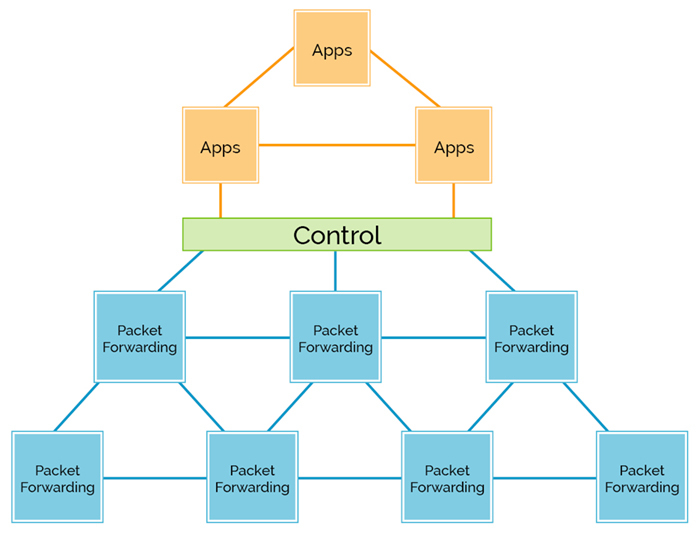 1: SDN optimizes the network infrastructure by separating the control plane from the data plane. NFV (network function virtualization) decouples network functions from proprietary hardware. DNS, caching, and other network functions become software operations that can run on COTS (commercial off-the-shelf) or commodity hardware. That means using whatever hardware is readily available, for the execution of any network function previously linked to specialized hardware, such as a router or firewall. Using COTS hardware in tandem with SDN and NFV makes the network flexible, adaptable, and virtualized: any service can run on any machine, and the services can be managed, switched or redirected in whatever way best uses the physical and digital resources available at a given time. Your old physical router is replaced by a software-controlled routing command, and the new, virtual router is what’s known as a VNF (virtual network function). VNFs work exactly like applications on a regular computer, or like apps on your mobile phone. RADCOM’s MaveriQ, as a matter of fact, operates as a VNF. Fig. 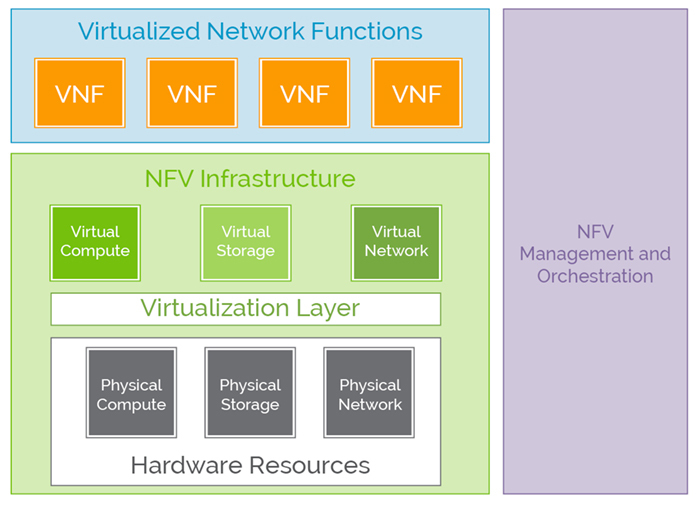 2: NFV virtualizes computer and network functions. MANO (NFV Management and Orchestration) allocates and deploys virtualized resources to support application-type VNFs. RADCOM’s MaveriQ solution is integrated into MANO: we are participants in the ETSI Open Source MANO project, as well as with AT&T’s ECOMP, which is due to launch open-source in the first quarter of 2017. We’re also partnered with leading programs including Intel, Nokia, and Hewlett Packard Enterprise. Our service assurance is an intrinsic part of the SDN/NFV/MANO system. Why is it so important to take the physical elements of a computer and reproduce them as virtual elements, if we haven’t actually gotten rid of hardware entirely? Because virtual elements are digital building blocks. And, once they’re virtualized, they can be broken down even further. Unlike hardware resources, virtual resources can be reconfigured and reallocated very easily. This is revolutionary, and one of the most outstanding advantages of cloud computing. Why? Cloud computing uses microservices. We decompose computer functions into smaller components that can act and interact. It is now possible to take the smaller, more agile microservice building blocks and recompose or reassign them at will. That’s obviously a lot harder to do with chunks of hardware. Fig. 3: Microservices: decomposed virtual functions, reassigned as needed. Microservices are modular (able to be restructured and used anywhere) rather than monolithic (larger solid elements). When we use virtualized functions in a cloud environment, we’re deploying agile microservices. One easy way to think of microservices is as molecules, or even pixels: little pieces that, combined, constitute a whole. The cloud, to many of us, is a vague and distant entity, probably somewhere above our heads. “The Cloud” most commonly refers to the clustered haze of data floating invisibly in the virtual space between big servers. As with neurons in a brain, the connection servers create has an intelligence of its own. That connection is the cloud. Cloud data is replicated in multiple locations. This helps packets move faster, reducing latency, improving service and making lost data recoverable even if a server is damaged or destroyed. When we discuss cloud computing in the context of telco, the terminology may sound very similar to IT lingo. That’s because, as we mentioned earlier, telecommunication is beginning to integrate technology that began in data centers. So what is a cloud-native telco solution? Right now, for telco, that means systems and networks based on NFV and SDN. And for service assurance, that means MaveriQ. Because MaveriQ operates as a VNF in the NFV set-up, and because it was built for the virtual world, it is a natural fit for any operator that is gearing up to go virtual. And because RADCOM’s MaveriQ works equally well with systems that are still fully or partly operating in a standard hardware domain, we are the natural partner for a forward-thinking telco that may not yet be ready to switch over to NFV. Although there’s an incoming operator stampede towards virtualization at the moment, with some larger telcos aiming for up to 75% cloud-based networks by 2020, not every CSP is ready to switch over fully just yet. For various reasons including the half-life of existing equipment, it may take time to turn over. Most telco providers will likely be operating in a hybrid environment for a while. That means you’ll be working with a dovetailed combination of your current network, and the sections of your networking system that you have already moved to NFV. This mixed electronic ecosystem is by nature complicated, and it will be changing with time. In order to deliver high-level service across this virtualization evolution timeline, it is important to choose a service assurance provider that can offer an integrated and stable end-to-end solution throughout the virtualization acclimation. RADCOM’s MaveriQ solution can provide an integrated monitoring system with an oversight of your customers’ experience across virtualized and partly-virtualized hybrid domains, as well as in a metalware-only network environment. It makes sense to choose MaveriQ now: you can transition to NFV gradually, at your own pace, knowing that you have invested in a unified, future-proof solution that will move with you down the line. And, if for whatever reason you choose to stick with a legacy style hardware-based network, we will continue to provide you with advanced services that fit your needs. We’ll be with you, assuring your service during the entire changeover regardless of how long it takes, or, even if you are not sure when you will be ready to make the switch to virtualization. NFV isn’t merely an impressive development, it is THE current telco industry disruptor. Like any new tech, it takes some getting used to, psychologically and practically. CSPs may worry that their subscribers will be negatively affected as service transitions. That’s the best reason to use MaveriQ: we assure smooth migration, at whatever speed, for any level of change. As your company progresses from virtualization to control to automation, know that MaveriQ’s completed this mission early. We’re already there. What makes your company feel anxious or unready to make the jump to NFV? Worrying that the transition will degrade the customer experience? Wanting to know if your service assurance coverage will carry you through the switch? Wondering if you can assure the ongoing integration of old, new, and hybrid environments? Let’s clear up your number one concern first: with proper service assurance, the subscriber should consistently experience high-quality service. With MaveriQ tools providing constant closed-loop monitoring with real-time alerts pinpointing problem spots, the network proactively self-heals, adjusting itself and rebalancing its load using built-in redundancies, without human intervention. In addition, RADCOM’s MaveriQ tool set is able to provide clear, full, automated coverage of your services. Our virtual probes quietly soak up data, then aggregate and filter it to provide visual reports that are easily understandable and simple to use. Working with MaveriQ eases the shift to NFV, and provides peace of mind to CSPs; they can enjoy the benefits of virtualization while remaining assured that their customer experience will retain its high standards. They may even enjoy the transition itself. It’s exciting to be part of this wave of new development, as long as everything is under control!